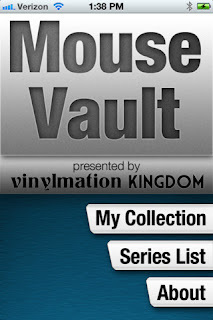 If you love Vinyls, then you have surely heard of Vinylmation Kingdom, an amazing resource for all things vinyl! The site is awesome for news and pictures and has now expanded their collector resources with the iPhone/iPod Touch app Mouse Vault. Mouse Vault is the only iOS app for browsing through and tracking your Vinylmation collection! The app is created by x19 Studios who also brought us great FREE trivia apps like "Mouse Trivia" and all of its spin offs! Basically, when you open the app you will see two main options one is "My Collection" and the other "Series List". 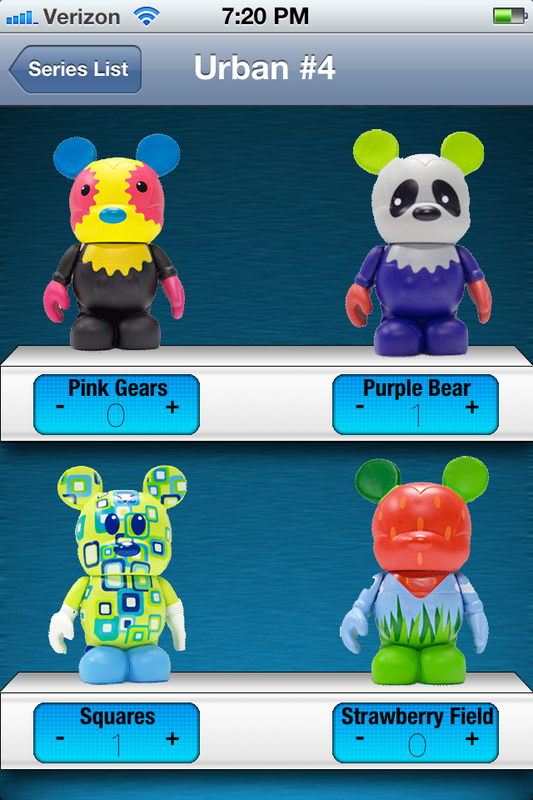 From the Series List option you can scroll through 95 different Vinylmation series (thats over 900 figures) and more than 97% of the Vinyls featured have images included in the app. From the Series Lists you can use "+" and "-" symbols to add to your own inventory. Items you add will then show up under your collection. You can then use the "My Collection" tab on the home screen to access the items you have checked off as part of your inventory. Whats in store for this fabulous new app? Well it looks like an iPad app will be on the way as well as images for any missing 3" figures. And from what I read over on the Vinylmation Kingdom facebook it looks like there will hopefully be an expansion into 9" vinyls, juniors, as well as planned regular (free) updates as new series are released. Another possible exciting addition may even be a wishlist function (I am most excited about this prospect)! All in all, this is a really great app, well worth the money! Its not just fun as a resource or a place to browse while you are deciding which Vinyls you want to snag on your next trip but as your own personal catalog. I really enjoyed the layout, the ease of use and how it makes me feel like I am carrying my vinyls in my pocket all the time! It is super fun for any type of collector (even if you haven't begun yet) and at under $3 it's the best money I have spent on an app in a long time! The app is created by x19 Studios (in partnership with Vinylmation Kingdom) who also brought us great FREE trivia apps like "Mouse Trivia" and all of its spin offs!